One of the big questions of the moment in China’s film distribution community is which movie has been or will be awarded the final valuable import quota slot for theatrical distribution. Depending on whose information you believe, the number of remaining slots is either one or none. As you’ll recall, earlier this year Xi Jinping agreed under great duress from Vice President Biden and the U.S. Trade Representative to increase the number of foreign films that can be distributed in China’s theaters via revenue-sharing arrangements from the previous 20 films per year to 34 this year and beyond. As a face-saving compromise, China decreed that the additional 14 films must all be “enhanced” films in either 3D or IMAX formats. Quota allocation is a big deal because China’s rev-share slots have become extremely valuable. China is now the world’s second biggest movie market, and even though the share that goes to the foreign distributor only tops out at 25 percent of box office receipts, that 25 percent can amount to 5, 10, or in some cases more than 20 million dollars going to a picture’s bottom line. The Jason Statham action pic The Mechanic earned nearly half its international gross in China, and it appears that the Australian horror flick Bait 3D will do the same. Because SARFT and the Film Bureau tend to be close to the vest with information, and because they have a tendency to change their minds, it’s a thorny problem to determine where quota allocations stand at any given time. Official decisions get reversed, permissions get revoked, and in some cases, as with the U.S.-Chinese co-production Looper and the French-Chinese co-pro Mystery, co-production status gets yanked at the last minute. Bait 3D has caused a great deal of head-scratching, as some sources have designated it an Australian-Chinese co-production, although I’m fairly certain that it was a flat-fee buyout film of Australian-Singaporean provenance. With the preceding caveat out of the way, I’ve detailed below my best knowledge regarding the films that have been released through quota slots so far this year. I show 16 of the 20 regular format film slots having been used already, with 3 of the remaining 4 spoken for, and 11 of the 14 enhanced film slots used, with the remaining 3 also taken. This leaves one regular format slot open. 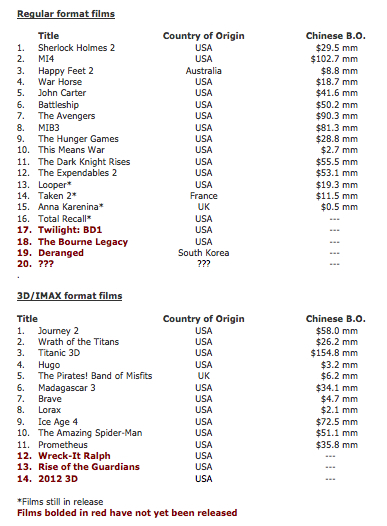 That one last slot is sure to be hotly contested, with studios lobbying heavily to secure it for themselves (studio execs, if you missed it, see my recent column on how to get ahead in China). MGM’s Skyfall and Warners’ The Hobbit were both likely candidates, but those two films have apparently been pushed to next year by China’s decision makers. I had heard a rumor that the Alfonso Cuaron sci-fi thriller Gravity was awarded the last slot, but since that film hasn’t been dated yet for a U.S. release, this seems unlikely. If you think I’ve gotten any of the above information wrong, or if you have knowledge regarding the 34th film, please write me so that I can update the chart. This entry was posted in Analysis and tagged China film distribution, Gravity, Hobbit, import quota slots, Joe Biden, revenue sharing, Rob Cain, Robert Cain, SARFT, Skyfall, U.S. Trade Representative, Xi Jinping by chinafilmbiz. Bookmark the permalink. Thanks Rob. You have a skill for distilling complex issues into easy-to-read posts. Cheo, thank you for your kind feedback!